I wanted to share with you the project I just finished. The goal of the project was to get the infos from de Xiaomi Flower Care and send them to Blynk from the ESP32. Xiaomi Flower Care is a 4 in 1 Bluetooth sensor to put in your flower pot. It measures soil moisture, light intensity, soil fertility and temperature. Also, it is self-sufficient with a small battery ! ESP32 is a “new” espressif chip that includes Wifi and Bluetooth, as ESP8266, developement boards including ESP32 are quite cheap, I personally use the LOLIN D32, and the Arduino IDE. After following the instructions, you should find all ESP32 boards in Tools > Board, and have the ESP32 libraries from espressif available. Now you need to know the address of your Flower Care (i.e mine is c4:7c:8d:66:e9:11). To do so, load the sketch BLE_scan.ino from the nkolban’s library in File > Examples > ESP32_BLE_ARDUINO. Run it near to your Flower Care, and you will have its address. Now you have the Flower Care’s address, you can fill it in the code, with your Blynk Token, SSID and Password. Don’t change any UUID ! Upload it and it should work ! It switchs ON Bluetooth, reads the values from the sensor, switchs OFF bluetooth, switchs ON wifi, connects to Blynk, sends Temperature and Moistures values to V6 and V7 pins, disconnects from Blynk and switchs the wifi OFF. The routine is done every 10 minutes (600000 ms). Why switching ON and OFF BT and Wifi ? Because the ESP32 cannot manage Bluetooth and Wifi at the same time, and when Blynk.run() is in the loop, Wifi is “constantly” used. This is why the sketch does not look like a “standard Blynk sketch”. Of course, you can change the sending period, and the vitrtual pins etc. Edit 17/08 : I experienced heat issues that lead into an ESP32 crash when running during a “long” period, even with the use of WiFi/BT disconnect. I don’t really know the root cause, but I re-write a code deleting the timer and adding a DeepSleep. Both codes are below. Heat problem is solved now ! // The remote service we wish to connect to. // The characteristic of the remote service we are interested in. // Connect to the remove BLE Server. // Read the value of the characteristic. Could you share a photo of the full setup with the flowers/plants? Here is a photo of the setup ! 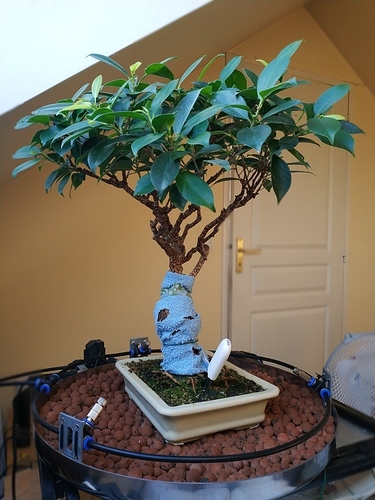 I use it for a Bonsaï Tree. ESP32 is only USB powered, nothing more. The sprinklers are triggered with Blynk, with a “classic” ESP8266 + relay setup (not detailed in my original post). I’ve try to connect to my Xiaomi , but do you have a special memory partition setup ? Have you got a idea to submit …? You have to change the Partition Scheme to “No OTA (Large APP)” as you can see it in my first post screen. But in case your partition setup is not good, you shouldn’t be able to upload the sketch (so you shouldn’t even have a CPU restart). I noticed some crash events, or device stuck issues while using the codes from the first post. So many thanks for your share , and your support… So usefull ! I have WeMos ESP32 Wi-Fi&Bluetooth Battery device. Mi Flora (Regular) sensor 4in1. It might be related to you Arduino IDE version. Try to update your Arduino IDE and use the last nkolban’s library version. Thank you [kaosss] for your answer! I will trying to night to do like you were writing. I used old version Arduino IDE 1.6.5. Good time for you Kaoss. A little bit from me in this. One more, I have WeMos esp32 wi-fi & Bluetoth battery. Version Arduino IDE 1.8.8. Handy setuping, esp32 in Arduino IDE like in manual, not a have had really effect. I’m use for setup a boards manager so: https://dl.espressif.com/dl/package_esp32_index.json. other scanners (BLE_Scan for iOS e.t.c.) or ESP32_BLE_ARDUINO show me uuid_write_mode and uuid_write_mode? It isn't were I can to see parameters of uuid_write_mode and uuid_write_mode? As you can see, serviceUUID, uuid_sensor_data and uuid_write_mode are the same for him and for me. I guess every Mi Flora have the same uuid for sensor data, write mode and service. So you can try with these uuid. Your last Code works great with my Lolin32 , thank for sharing! Only the ESP.restart(); at the end i removed, because my device loops endless. Are the bridge commands neccesary? I dont understand the meaning of it. What is the best way to request more than one Flora device? I tried with a simple counter at the end and another getSensorData() call with another adress, but that didnt work.